It is widely accepted that limiting climate change to 2°C will require substantial and sustained investments in low-carbon technologies and infrastructure. However, the dominance of market fundamentalism in economic thinking for the past three decades has meant that governments have generally viewed large spending programs as politically undesirable. 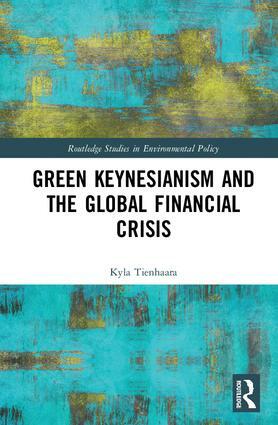 In this context, the Global Financial Crisis (GFC) represented a huge opportunity for proponents of public investment in environmental projects or “Green Keynesianism”. This book examines the experience of Australia, Canada, Japan, Korea, and the United States with Green Keynesian stimulus programs in the wake of the GFC. Unfortunately, on the whole, the cases do not provide much optimism for proponents of Green Keynesianism. Much less funding than was originally allocated to green programs was actually spent in areas that would produce an environmental benefit. Furthermore, a number of projects had negligible or even detrimental environmental outcomes. While the book also documents several success stories, the research indicates overall that more careful consideration of the design of green stimulus programs is needed. In addition to concrete policy advice, the book provides a broader vision for how governments could use Keynesian policies to work toward creating an “ecological state”. “Governing the Global Green Economy?” Global Policy 7(4): 481-490. “Green Stimulus and Pink Batts: The Environmental Politics of Australia’s Response to the Global Financial Crisis”, Journal of Australian Political Economy 76: 54-78. “Varieties of Green Capitalism: Economy and Environment in the Wake of the Global Financial Crisis”, Environmental Politics (2014) 23(2): 187-204. “A Tale of Two Crises: What the Global Financial Crisis Means for the Global Environmental Crisis”, Environmental Policy and Governance (2010) 20 (3): 197-208.